Belgian-born, French-based World Boxing Federation (WBF) Womens World Light Welterweight Champion Oshin Derieuw is in for a tough task when she makes her first title-defense on November 10 in her home-town of Henin-Beaumont. 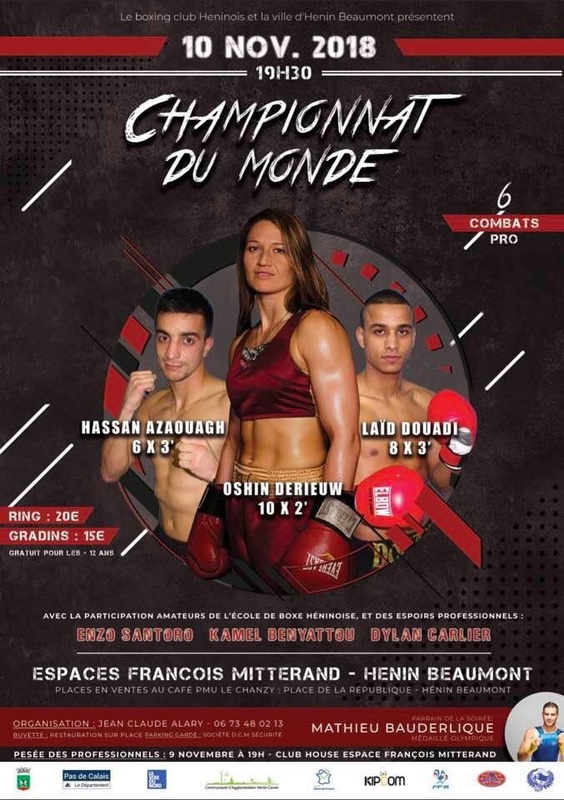 Undefeated Derieuw, 9-0 (4), who won the WBF world title with a unanimous decision over Lina Tejada last April, takes on another Dominican in former IBF and WBA World Champion Dahiana Santana, 36-9 (15), headlining a show at the Espace Francois Mitterand. Since becoming world champion, Derieuw returned to her birth-country for a stay-busy fight against former European title-challenger Elfi Philips (9-4-3) in early October, winning a hard-fought decision after eight close rounds. 33-year-old Santana made her professional debut as a seventeen year old Featherweight in 2002, and has since been successful in moving up and down in weight to take on some of the best in the world. Now campaigning at Light Welterweight, she is aiming to become a three-time world champion. Also on November 10 at the Palestra BFIT in Quartino, Switzerland, Andrija Petric, 8-0 (1), will square off with hard-nosed Bulgarian Ivan Emilov, 4-3 (3), for the vacant World Boxing Federation (WBF) Eurasia Cruiserweight title. For both Petric (36) and Emilov (30) it will be their first chance to win a professional title. While Petric is a healthy favourite on home ground, Emilov has only lost to undefeated opponents, and never inside the distance, so he is expected to make things difficult for the local man.